Today, Christmas is a huge production of feasts and family gatherings, gift giving, holiday events and an overwhelming need to stay busy. Too often, the truth about Christmas gets lost in the shuffle. Recall with me the most amazing truths of the Christmas story as we focus not on Santa and his reindeer, but on the God of the universe humbling himself, being born as a lowly child as the God-made-man. • When the archangel, Gabriel, shared God’s promise of a son, the aged temple priest, Zechariah, doubted God (Luke 1:18). Zechariah was struck mute. Yet, in faith, young Mary, humbly received Gabriel’s great proclamation, and responds, “May it be to me as you have said” (Luke 1:38). • What had Mary achieved in her few years of life to merit a greater honor and blessing than any other woman in the world? Mary’s record is brief and simple, she fell into favor with God as He extended His grace to this young woman. • The Shepherds were seen as rough, uncultured, untrustworthy fellows. Because of their poor credibility, shepherds were not allowed to testify in court. Yet, the first account of Christ’s birth was from the shepherds, who were “glorifying and praising God” (Luke 2:20). The key for each of these participants was their faith in God and their willingness to believe what he said. It can be easy to trivialize Christmas. It is not uncommon to hear well-known sayings such as: “Jesus is the reason for the season,” or “Keep Christ in Christmas” and they are so very accurate. But the miracle of Christmas, which is a true story, can become watered down and its power to transform lives gets missed. Let us shine light again on the amazing truth that, “The Word became flesh and made his dwelling among us” (John 1:14). • “God with Us” (Matthew 1:23) – In Exodus, God appeared in the cloud, as a pillar of fire, or on the mountain. But then, in a common feeding trough, He became Immanuel (Isaiah 7:14). • “Good News of Great Joy” (Luke 2:10) – The good news transcends politics, languages, and geography. A Savior is given to all mankind, making us the recipients of God’s good will and favor. • “Lying in a Manger” (Luke 2:12) – We must marvel at the humble entrance of the Eternal, Almighty Creator, God, into our world. 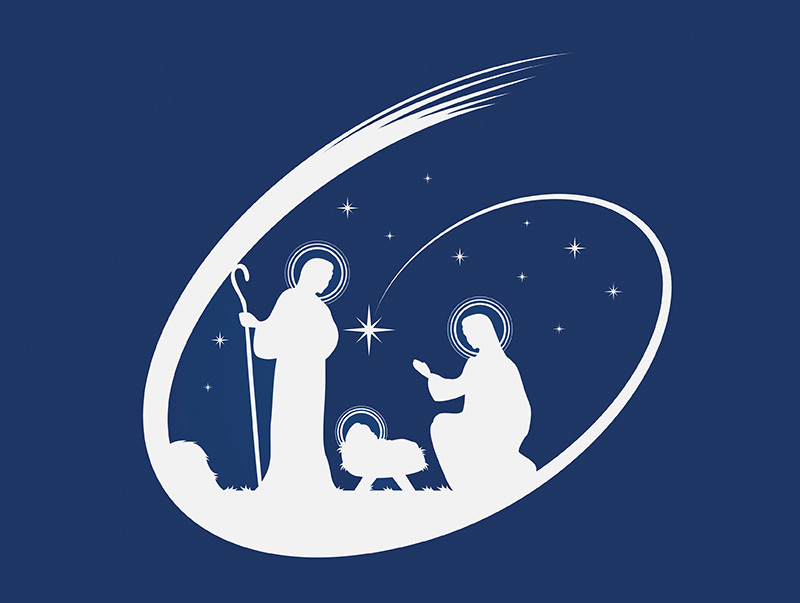 The Savior of mankind, found lying in a manger (feeding-trough), thus giving the shepherds a specific sign to guide them to the Christ-Child. When we stop to consider the details of the Christmas story, some might ask, “What is wrong with this picture?” In the world that God created, there was no room for Him at the inn, or anywhere. To have “God with us,” the God-Child entered the world in a place where few would even notice. His return to His creation was not “good news” to everyone. No ruler was willing to abdicate their throne. No palace opened their gates to welcome the Prince of Peace and King of kings. God, who is omnipotent, omnipresent, and all-righteous, longed to reach everyone – the beggar, the prostitute, the leper – as He still does even today. Therefore, he presented Himself as a helpless infant, “lying in a manger.” It is common knowledge that regular folks cannot simply walk in to the palace of a newborn king, uninvited. But kings and princes can visit mangers any time they so choose. For those who are willing to accept the details of this amazing, true story and allow it to penetrate their hearts and transform their lives, the Nativity scene does not just put us into a festive “holiday mood.” It stirs us to the very depths of our souls and calls us to remember that quiet, unassuming evening when the God of the universe changed our world forever. How will we respond to the Divine Designer who sacrificed everything to bring us back into a relationship with Him? Take away the decorations, the presents, and the food… the story is still there. It is still true, and our joy is still great! You can read the account of Jesus’ birth from the Bible in Luke 2:1-21.